In these days of plug-ins and virtual effects etc. there are still some people using racks filled with 'stuff' for the geeks to fiddle around with knobs and buttons, whether it be outboard effects or amplifiers etc. The Adam Hall range of products are one which I have found to be of good quality and at a price which is good. I was not sure whether to go for this unit or the multi-colour light units, but did not really think I would be flashing the rack in multi-colours so went for this. The unit itself is very well built and not too heavy. It has a function button which can provide different levels of brightness or hold it down and it goes off. For general use in a dark'ish studio it easily provides enough light to see the knobs and buttons. 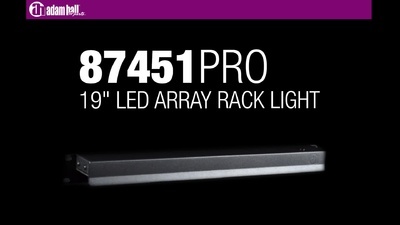 Mine is fitted at the top of a 12 unit rack and it sprays the light down pretty much to the bottom. The hood stops the light spraying into the room and keeping it only over the rack. The unit has an external power supply which is OK, but would have been nice to have it built in, but at around 30¤, it does it's job, once installed you can forget about it and I can't really complain. been using it for about 8 months now and works just fine. ID: 358249 © 1996–2019 Thomann GmbH Thomann loves you, because you rock!